Valuable IP will define an upcoming chapter in China’s growth story. China recognizes that innovation is an imperative for its long-term economic growth. Less discussed amongst the country’s initiatives to promote innovation is the fact that China’s national system for protecting IP rights continues to strengthen. The rapid evolution of China’s IP system requires emergent IP strategies from all domestic and foreign firms. Over the past three decades, China’s tremendous output gains, in terms of GDP growth, have been fueled primarily by capital accumulation and investment. China’s production frontier has also been pushed outward by its large supply of labor. A third source of growth stems from productivity increases associated with technology adoption, learning, and more efficient capital and labor allocation. Of course, these gains are not infinite. The country aims to shift its economy toward consumption and away from the presently high percentage of investment-to-GDP. The massive labor supply is limited by aging, curtailed by the previous one-child policy, and necessarily subjected to increasing wages. The productivity gains from borrowed foreign technology slow with widespread diffusion. Most of this analysis of China has been well-publicized. The four Asian tiger economies, South Korea, Taiwan, Singapore, and Hong Kong, can recite several chapters from the same book of rapid, then decelerating growth due to diminishing returns on capital, labor, and technology catch-up. In the illustrative figure below, Path B shows the asymptotic trajectory resulting from these phenomena. Sustained growth relies on consistent pressure on the production frontier via productivity gains from core, internal innovation. 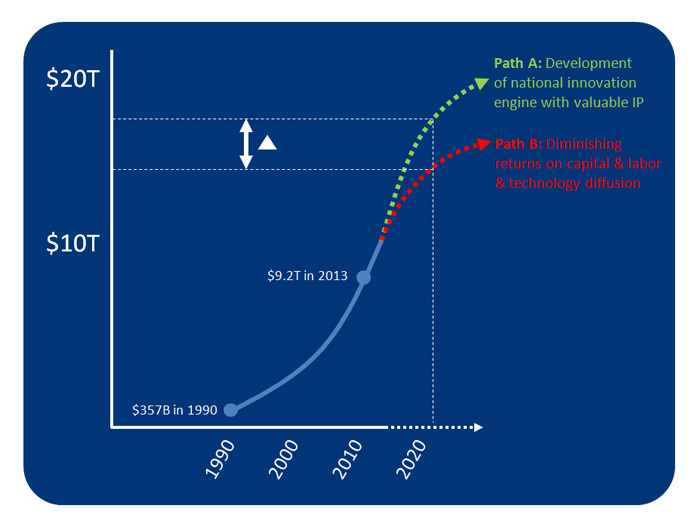 In the figure below, Path A illustrates a higher growth trajectory. The impact of successful internal innovation will far outweigh any short term stimulus measures, such as easing of monetary policy by China’s central bank, the People’s Bank of China . Government policies. In statements and in action, China is encouraging entrepreneurship and reducing competitive barriers . China’s increasingly college-educated workforce. According to the Ministry of Education, China has more than 2,000 higher-education institutions and 8 million annual graduates . By 2020, the NY Times estimates a college educated workforce of 195 million . R&D focus. The OECD reports China’s R&D intensity continues its rise, now above 2% of GDP . A strong IP protection system is less frequently discussed but a major driver of innovation. Strong IP rights enable the innovation process, from invention to development to commercialization. For example, IP rights provide incentive for inventors to create, give investors a platform to finance, and encourage multinationals to partner and market. While a patent promises essential IP rights, patenting volume alone is not correlated with the core innovation that China seeks. High quality IP is required to accrue these benefits. Such quality and value results from a strict, efficient, enforceable, and well-regarded system . Patents  are managed by the State Intellectual Property Office of the People’s Republic of China (SIPO), which is undoubtedly drawing on the ongoing reform and learning in the US system . Ultimately, innovation within China will be derived from the combination of commercially-aligned R&D with valuable IP. China must innovate to achieve future productivity gains that will sustain its economic growth. The delta between Path A and Path B will eventually be measured in $ trillions. Given the connection between innovation and IP, it’s not surprising to see major shifts in the country’s approach to IP protection, from the increasing size and speed of patent infringement awards to SIPO’s action plan for IP-intensive industries. The evolving environment affects any firm with China in its supply chain. This includes any firm with manufacturing or R&D operations there. Of course, it also includes those selling in China today and particularly in the future. Without a flexible and emergent IP strategy, these firms risk a severe competitive disadvantage.